The Sydney Roosters are the new NRL premiership leaders after seeing off a injury-hit Penrith 42-6 at Centrebet Stadium on Friday night. Two tries from Boyd Cordner, and efforts from Daniel Tupou, Jake Friend, Aidan Guerra, James Maloney and Roger Tuivasa-Sheck sealed a record win over the Panthers in front of a crowd of 11,879. The heavy defeat effectively ends Penrith's finals aspirations and they were hit by two new injury blows. Sika Manu and Adam Docker were both forced out of the game at halftime with broken hands to join an already lengthy casualty list. It had all started so well for Ivan Cleary's side when David Simmons took his try total for the season to 16 by diving over after just two minutes. That early setback woke up the Roosters and they responded through Tupou in the 13th minute and took the lead just after the half-hour mark when Jake Friend crashed over from close range. Down to 15 men, the Panthers conceded again just after the restart when Cordner bullied his way to the line, but the hosts looked to have pulled a try back almost immediately through Simmons. 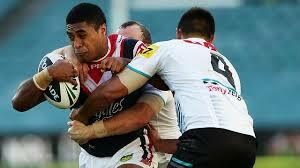 Whare produced a marvellous kick over the top of the onrushing Roosters defence and Simmons lunged forward to score. However, the video referee thought otherwise and overruled the on-field officials and the try was chalked off. That disappointment knocked the stuffing out of the hosts and the Roosters stepped up a gear and blew them away with their giant forward pack dominating their depleted opponents. Guerra and the outstanding Maloney eased their way over midway through the second stanza and the brilliant Tuivasa-Sheck scored the try of the night to add some extra gloss on the score. The young Kiwi was put clear by Shaun Kenny-Dowall, and showed some brilliant footwork to dance his way to the line. Penrith, to their credit, continued to keep pressing until the final siren, with skipper Kevin Kingston butchering a great chance late on to add some respectability to the scoreline. However, Cordner, put clear by Maloney, added his second in the dying seconds with the five-eighth making it a perfect night with the boot by kicking his seventh conversion.